The Brazilian full-back did not mince his words after seeing his team once more fall short in Sunday’s draw against Celta. MARCELO ADMITTED REAL Madrid are sad and feeling low after falling 16 points behind runaway La Liga leaders Barcelona. Defending champions Madrid and their stuttering season continued on Sunday, held to a 2-2 draw by hosts Celta Vigo. Gareth Bale scored twice to cancel out Daniel Wass’ opener and give Madrid the lead before half-time. But it was not good enough for Madrid as Celta equalised in the 82nd minute via Maxi Gomez after Iago Aspas had his penalty saved 10 minutes earlier. 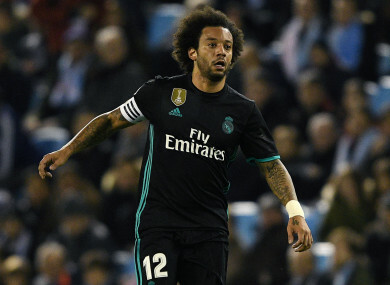 We’re sad and we’re f****** sunk,” Marcelo said afterwards. “We’re trying to get out of this mess and we’re working to do that, but we don’t like this at all. “It’s difficult because the more matches you draw or lose, the more the pressure increases. We can’t do anything else. Madrid, who are winless in their past four away matches in La Liga, are fourth in the league, behind second-placed Atletico Madrid and Valencia. Email “Marcelo: 'Sad' Real Madrid are 'f***ing sunk'”. Feedback on “Marcelo: 'Sad' Real Madrid are 'f***ing sunk'”.